Heat oven to 350°F (180°C) or 325°F (160°C) for dark or non-stick pans. Lightly grease or spray with non-stick cooking spray, bottom and sides of three 8-inch (20 cm) or three 9- inch (23 cm) round baking pans. Make cake as directed on package. Divide batter evenly among pans. Bake 18 to 20 minutes or until toothpick inserted in centre comes out clean. Cool 10 minutes; remove from pans to cooling racks. Cool completely, about 1 hour. Freeze pieces uncovered about 1 hour for easier frosting if desired. Tint vanilla or white frosting with orange and yellow food colour to make a light tan colour for the burger bun layers. 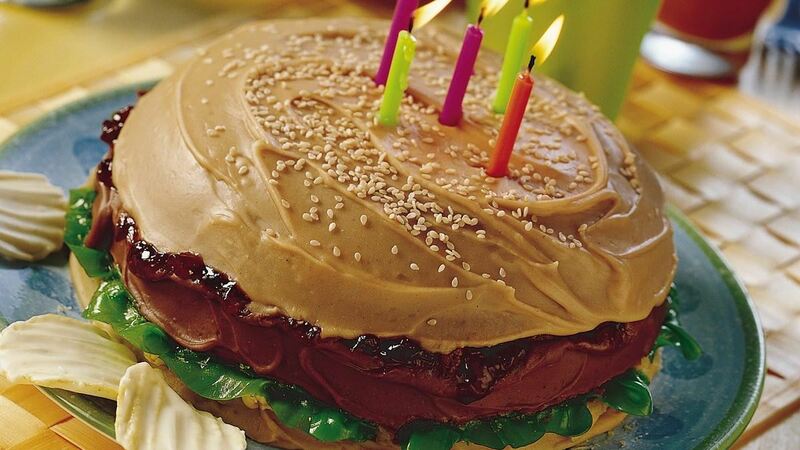 Use chocolate frosting for the burger. Place bottom cake layer on serving plate. Frost side only of layer with tan frosting. Frost top of bottom layer with part of the chocolate frosting. Place middle cake (hamburger) layer on top; frost top and side of middle layer with chocolate frosting. Drizzle side of middle layer with strawberry jam to look like ketchup. Place remaining (rounded) layer on top. Frost with remaining tan frosting. Immediately sprinkle top of cake with sesame seeds. If you have only two 8-inch (20 cm) or two 9-inch (23 cm) round baking pans, cover and refrigerate the rest of the batter while baking the first two pans. Then bake the third cake in the cooled round baking pan.